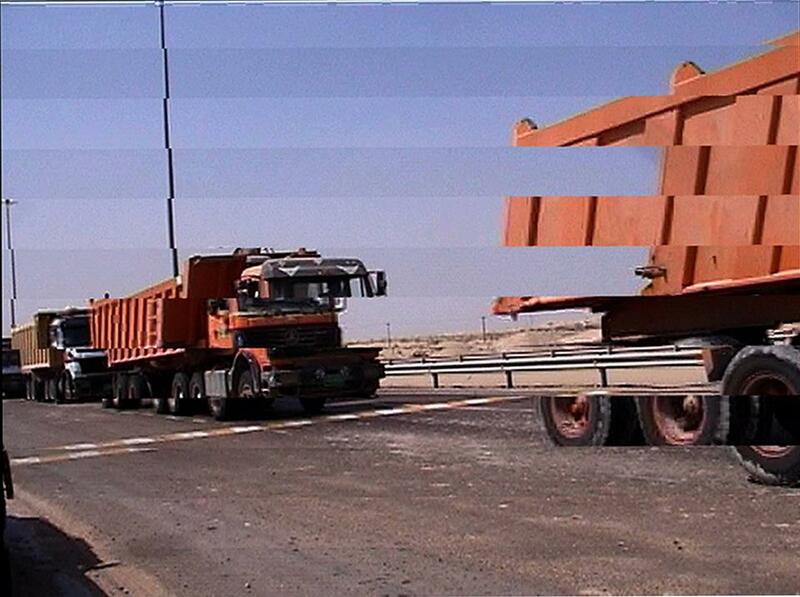 For the July Cinenova Now Showing, artist Charlotte Prodger has chosen to show two films from the Cinenova collection alongside an excerpt from her film Stoneymollan Trail. Named after an ancient ‘coffin path’ in Scotland linking the Firth of Clyde with Loch Lomond, Stoneymollan Trail traces a history of recent video formats as well as the artist’s personal history. It comprises footage from her archive of deteriorating miniDV tapes shot between 1999 and 2013; high definition camera footage; iPhone videos and screen-printed graphics. This roiling miscellany of material is punctuated by static views from windows overlaid with the names of cross-streets in Glasgow where she has lived and worked in recent years. Prodger asks friends to read two decades worth of her tape logs, while she herself inhabits other subjectivities by re-speaking the words of post-minimalist artist Nancy Holt, science fiction writer Samuel Delaney and musician Nina Simone – exploring the contingent limits between self and other via intimacy, labour, language and loss. New York trucks, both menacing and toy-like, over feminist performance group Disband in songs of political and environmental declamation. Coalmining Women traces women�s significant contributions to past coalfield struggles and the importance of their newer position as working miners. Charlotte Prodger (b.1974) lives in Glasgow and is represented by Hollybush Gardens and Koppe Astner. Solo shows include Subtotal, Sculpture Center, New York (2017); BRIDGIT, Hollybush Gardens, London (2016); Kunstverein Düsseldorf (2016); 8004-8019, Spike Island, Bristol (2015); Nephatiti, Glasgow International (2014); Markets with The Block, Chelsea Space, London (2014) and Percussion Biface 1-13, Studio Voltaire (2012), London. Group shows and screenings include Lichtspiele, KW Institute for Contemporary Art, Berlin (2017); British Art Show 8 (2016); Weight of Data, Tate Britain, London (2015); The Secret Life, Murray Guy, New York (2015); An Interior that Remains an Exterior, Künstlerhaus Graz (2015); Assembly: A Survey of Recent Artists’ Film and Video in Britain, Tate Britain (2014), Holes in the Wall, Kunsthalle Freiburg (2013) and Frozen Lakes, Artists Space, New York (2013). Performances include Orange Helvetica Title Sequence, NY Book Art Fair, MOMA PS1 with Bookworks (2014); Fwd: Rock Splits Boys, Café Oto, London, with Electra and Re: Re: Homos and Light, Artists Space, New York, collaboration with Mason Leaver-Yap (both 2013). Charlotte Prodger won the 2014 Margaret Tait Award and is shortlisted for the 2017 Jarman Award. She has forthcoming solo shows at Tramway, Glasgow and Bergen Kunsthall and a project with If I Can’t Dance I don’t Want to be Part of Your Revolution, Amsterdam. Tina Keane (b.1940) is an internationally acclaimed artist who has worked since the 1970s in a wide variety of media, ranging from performance and installation to film, video, digital technologies and neon sculpture. An influential and consistently inventive artist, she is a leading exponent of media installation work. Her work encompasses social issues, poetries of memory, and constructions of gender, aesthetic pleasure, technical experimentation and explorations of visual perception. Keane has exhibited widely both nationally and internationally and has been Artist in Residence at various institutions including the Banff Centre in Canada. She is a founding member of Circles and curator and programmer of exhibitions and screenings including The New Pluralism exhibition at the Tate (with Michael O’Pray, 1985). She has won awards from the Arts Council, Channel 4, the British Council and London Production Board. Transposition, Keane’s major performative projection from 1999-2000, was re-performed and screened in Tate Tanks in October 2012, and her short film, Beauty in Motion was screened at the 2013 London Film Festival. Elizabeth Barret’s work is shaped by the history, culture, and social issues of Appalachia. Her films/videos are produced with the artist-centered organization Appalshop where she works across a variety of disciplines including visual arts, folk and traditional arts, and media arts to advance new dialogue about documentary practice and socially engaged community-based art. Barret is the recipient of a Guggenheim Fellowship in the Creative Arts, Rockefeller Foundation Film/Video/ Multimedia Fellowship, and Kentucky Arts Council’s Al Smith Fellowship in Media Arts. Her self-reflexive exploration and meditation on issues of media representation, Stranger With A Camera (2000), premiered at the Sundance Film Festival and was broadcast nationally on PBS series P.O.V., the longest running showcase for independent non-fiction film. Cinenova: Now Showing began in March 2015 and runs monthly. The series intends to materialise relationships between contemporary artist moving image practice and the feminist and organising legacies present in the Cinenova collection. Now Showing future invited protagonists include: Kimberley O’Neill, Onyeka Igwe, Holly Antrum, Letitia Beatriz, Olivia Plender and more to be announced. Past events have been with Oreet Ashery, Leone Knight and Jenni Olson; Alex Martinis Roe, Helen Grace and Margot Nash; Ayesha Hameed and Sandra Lahire; Jamie Crewe and Tran, T Kim Trang; Kathryn Elkin and Sarah Turner; Noski Deville and Patrick Staff; Kari Robertson and Judith Barry; Nooshin Farhid and Lis Rhodes; Rehana Zaman and Lai Ngan Walsh & the Law Collective; Lucy Clout, Tracey Moffatt and Susan Stein; Cara Tolmie, Kimberley O’Neill and France-Lise McGurn, Judith Barry and Ruth Novaczek; Justice for Domestic Workers and Leeds Animation Co-op; Claire Hope and Judith Barry; Lucy Parker and Adriana Monti; Kate Davis, Margaret Salmon and Sheffield Film Co-op; Richard John Jones and Karen Everett; Grace Schwindt and Kim Longinotto.